You are here: Home » News » Product News » Aluminum alloy glass garage door PC board with better results? Now according to different needs of customers, there are many choices when choosing a garage door: a roller-type garage door, a sectional garage door, and the sectional garage door has a European effect, more generous. 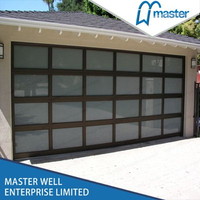 There are also a variety of sectional garage doors, iron intermediate PU foam garage doors, copper garage doors, wooden garage doors, aluminum garage doors. These sectional garage doors are actually much the same, that is, the door material is not the same, the structure is similar. 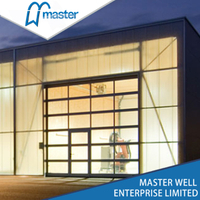 However, as a new type of aluminum alloy garage door, it has become more and more popular. Today we will talk about one of the aluminum alloy garage doors: aluminum alloy pc garage door, Let us explore this aluminum alloy garage door. 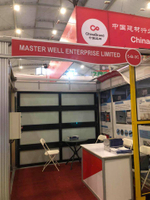 Compared with other iron garage doors, copper garage doors, wooden garage doors, aluminum garage doors with visual pc board, good light transmission, used in shopping malls, 4S shops, hotels and other commercial places. And high-end villas can also be used, generous and beautiful. In addition to the visible pc board, the aluminum alloy pc garage door can also be matched with the mating effect of the pc board, so that in addition to a certain light transmission, it also achieves better privacy. In consideration of different customer requirements, in addition to anodized aluminum profiles can be provided, the profile shape can also be sprayed into different colors, white, black, brown, yellow, etc., and the surface after spray is smooth and beautiful. 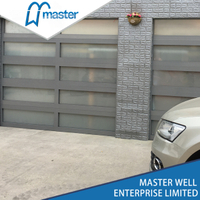 At the same time, the aluminum alloy garage door can be equipped with a pc board, and the whole door frame and glass combination are beautiful and fashionable. The pc board is easy to maintain and easy to clean. If it is rain, it can be cleaned by itself, or it can be cleaned with soap and soft cloth. At the same time, the surface of the aluminum alloy is smooth, and the door can be cleaned in the same way. The resistance of the pc board is large, so the door is relatively wide and can be matched with the pc board. The pc board enhances the extension performance of the entire door. Because the pc board is lighter than the glass, if the door is relatively large, the pc aluminum alloy garage door can be selected, so that the door body is light, the door body burden is not so large, and the door body is not easily deformed, and the appropriate motor can be used. 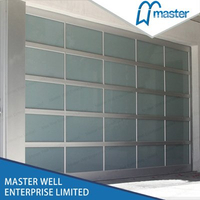 For the convenience of real life and work, without hindering the car going in and out, the aluminum alloy hollow glass garage door can be equipped with a pedestrian door, which is convenient for people to push open the small door in and out, which is efficient and convenient. This garage door is equipped with a motor, which can realize Bluetooth control of the mobile phone, wall switch control and remote control. Aluminum alloy garage door customers have higher requirements on the door. Such garage doors are generally not recommended for manual operation. All need to be equipped with motors. The garage door of the motor configuration has a certain sense of technology and fashion. The motor can be equipped with infrared, which can rebound when the garage door is blocked, ensuring personal safety. 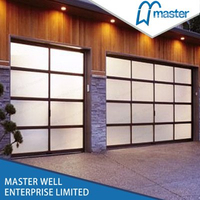 The complete set of aluminum alloy garage doors requires hardware accessories. Configurable hardware accessories are relatively flexible and can be easily disassembled, highly wear-resistant parts, better maintenance, in addition to electronic parts warranty 1 year, other hardware accessories 5 years warranty. 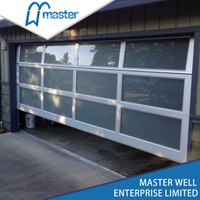 The aluminum alloy garage door produced by Master Well is more elaborate than the general garage door. Generally, it is necessary to configure the wire anti-breaking bracket and the torsion spring to prevent the middle axle frame, all for safety.